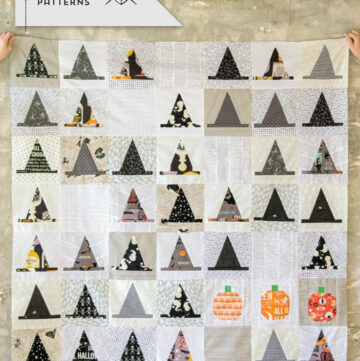 It’s week 3 of our Halloween Haberdashery Quilt Along and today I wanted to share with you some quilt piecing tips and tricks that you can use while you are constructing your blocks. 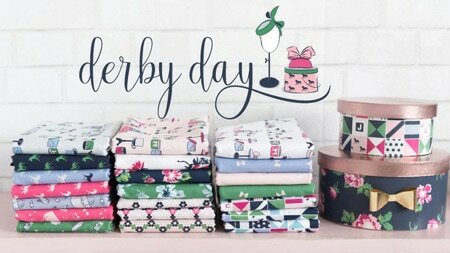 Since I was sitting down to write up the quilt piecing tips I thought that I’d make this post a bit more universal so that the tips apply to quilt piecing in general. Not just the Halloween Haberdashery quilt. There are a couple of points that do apply specifically to the Halloween quilt, I’ve noted in the tips section, which ones those are. 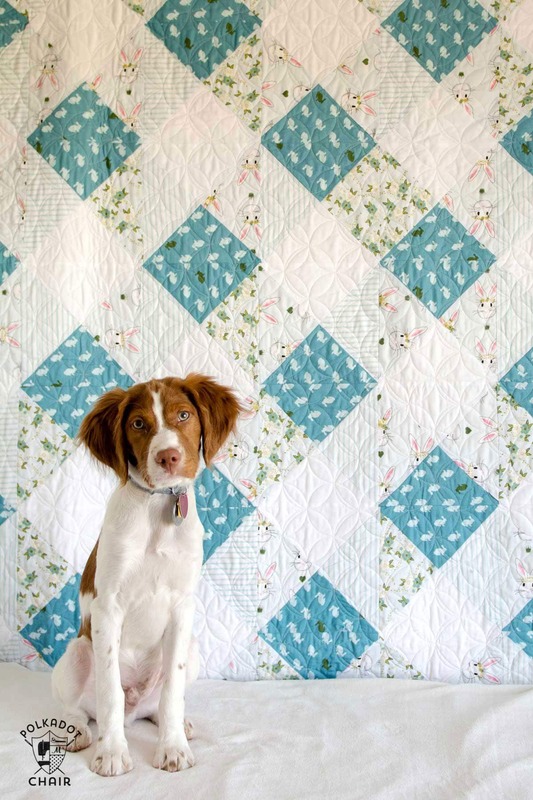 If you’re a long time quilter, I’m guessing that you may also have some fantastic quilt tips to share. If you do feel free to leave them in the comments section so that everyone can benefit from your knowledge! I’m primarily a self-taught quilter. I’ve had lots of friends help me along the way. I’m always grateful when people are willing to share their knowledge with others. Since I am mostly self-taught, there are a lot of things that I learned the hard way. Which is where most of these tips and tricks originated. I also get questions from you guys frequently. I thought I’d also address some of the most FAQ’s about quilt piecing that I get. 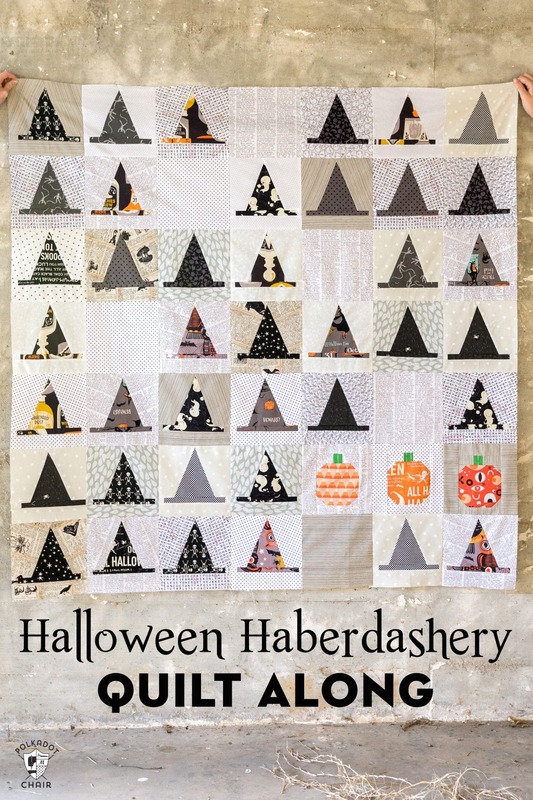 If you’re just joining in with our Halloween Haberdashery Quilt along, you can CLICK here to see the introductory post. It explains what we are doing and where you can grab the pattern. 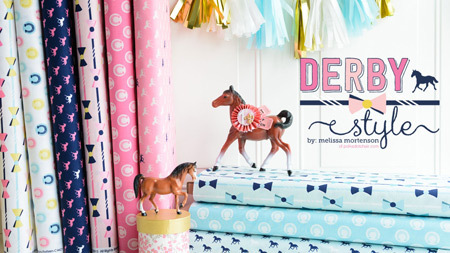 If you are just joining in, or you’re not done cutting out your fabric. I do NOT want you to feel like (or even say out loud) that you are behind. You are not behind. There is no such thing. This is not a race. It’s a quilt along for fun! Something to distract you from whatever you need to be distracted from in your life (for me right now it’s my teenagers and messy house). Please join us and work at your own pace. The schedule notes that you have 2 weeks to piece your blocks. DO YOUR BEST. Divide up the blocks to piece and pick a certain number to work on per night. Or try to devote a specific time in the week to make the quilt. Then just work at your own pace. This is a “quilt police” free zone! If you get frustrated, stop and take a break. You’ll make more mistakes and it will cost you more time in the long run. This quilt pattern (and most all quilt patterns) are designed to fit together like puzzle pieces. Each piece has a 1/4″ extra on it to account for seam allowance. If you sew your pieces together and your seam allowance is not exactly 1/4″ your quilt block will not line up properly. Imagine puzzle pieces that are too big or too small. I use a 1/4″ foot on my sewing machine and a seam guide. My machine came with one. If yours didn’t you can purchase a magnetic one that will attach to your machine. You can also use a bit of washi tape or painters tape to tape off the 1/4 mark on your machine. 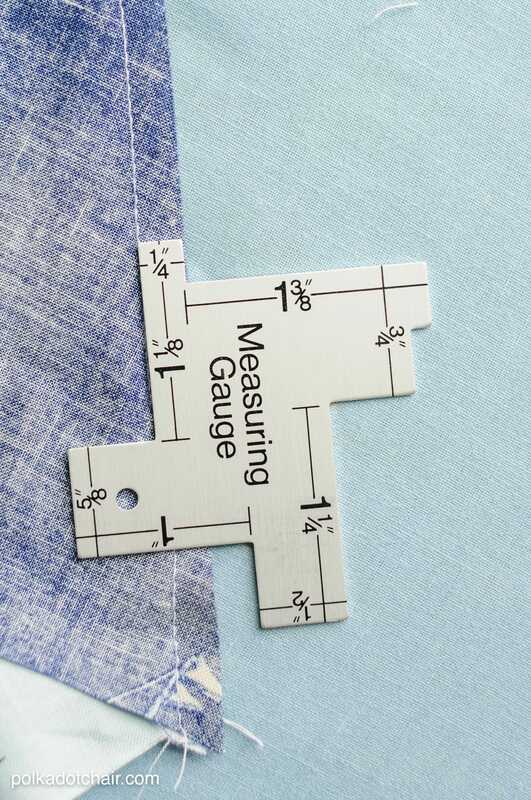 When I think I’ve got my seam allowance where I want it, I check it with a seam gauge. I have this simple one. After you’ve figured out where 1/4″ is on your machine, make sure that you are consistent with keeping it throughout the quilt construction. When you iron your clothes you move the iron back and forth. 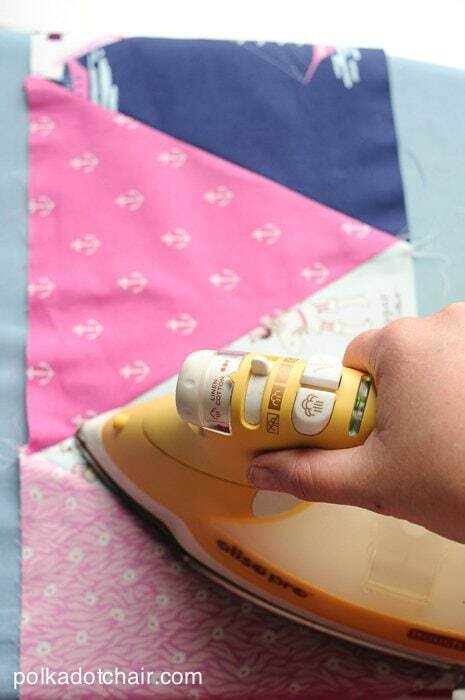 If you iron your quilt seams you run the risk of stretching your fabric out of shape. Which will cause problems when you’re piecing your quilt blocks. 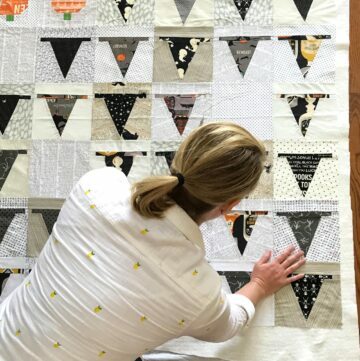 The Halloween Haberdashery quilt is especially “at risk” for stretching seams since the triangle pieces are cut at an angle. (Fabric stretches more on an angle due to the weave of the fabric). When you iron the seams in your quilt block. PRESS them. Don’t iron them. 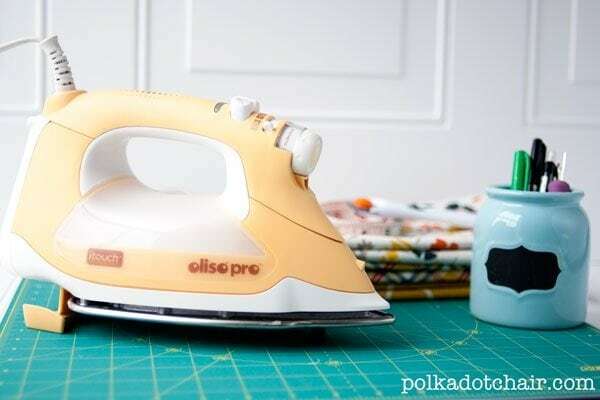 Pressing means to move your iron up and down and apply firm even pressure. When you need to move your iron to another part of your seam, pick it up and move it. Don’t slide it. There are few things I hate more than making a quilt block and having it come up 1/2″ or 1/4″ too short in the width or the height. When I want an 8″ x 8″ block I want it to be exactly 8″ x 8″. I have found the best way to get a quilt block the size I want it, is to trim it down after it has been pieced. 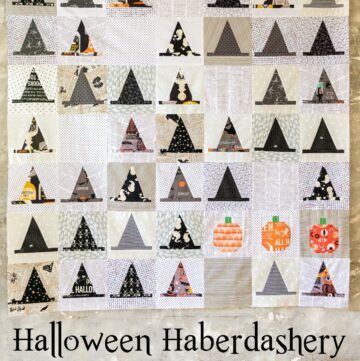 For that reason, there is a lot of trimming in the Halloween Haberdashery Quilt. It is designed on purpose to be a bit large, then trimmed (and squared up) at the end. That way you get perfect square blocks. When you’re trimming, just remember, you can always trim the piece down more, but you can’t add fabric back on that you cut off. So be conservative with your trimming, until you get the hang of what you’re doing. The bottom of the quilt block (the piece with the hat brim) is needed to be trimmed to size before it’s attached to the bottom of the hat. When I was making the block, 1/2 of the time I came up short on that piece. The two fabric pieces on the sides of the brim are pretty small, and the smaller your fabric, the easier it is to get “off” with your stitching or pressing. So I gave you a bit of leeway on that part of the block. When you go to trim it to the right size, make sure that you keep the center of the brim in the center. Otherwise, you’ll end up with a wonky block. Line up the center of the brim with the center of the hat. If your centers are marked clearly you can trim the brim piece at the end, instead of as you go. It’s up to you. 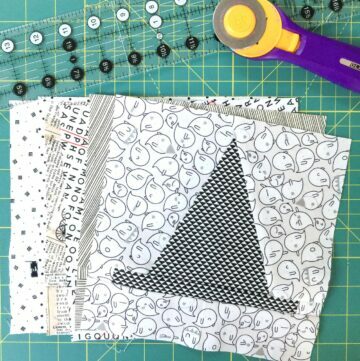 While you’re trimming your blocks, I find it easier to use a smaller ruler (like 18″ long) instead of a big quilt ruler. 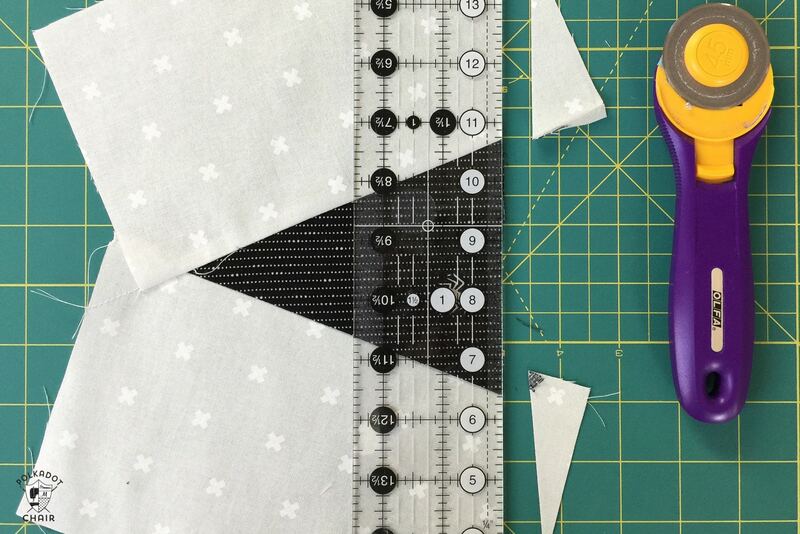 You’re working with smaller pieces of fabric and there is just less ruler to get in the way. 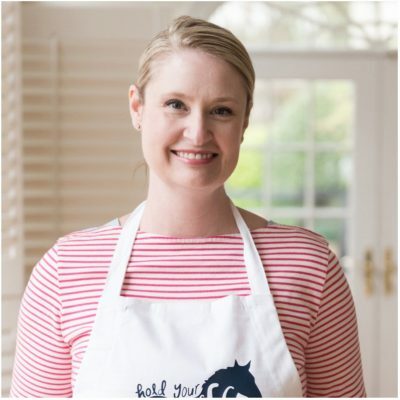 This is a tip I learned from Alison of Cluck, Cluck Sew. If you are pressing in “bulk” (i.e. many quilt blocks at a time). Press one block then while it’s still warm, put it under a heavy book either on your ironing board or table. Then add the next “warm” block on top. Keep doing this until you’ve got too many blocks, then move them out from under the book and start again. The heat of the block under the big book with flatten out your seams for you. Okay, this is a question or “correction” that I get a lot. 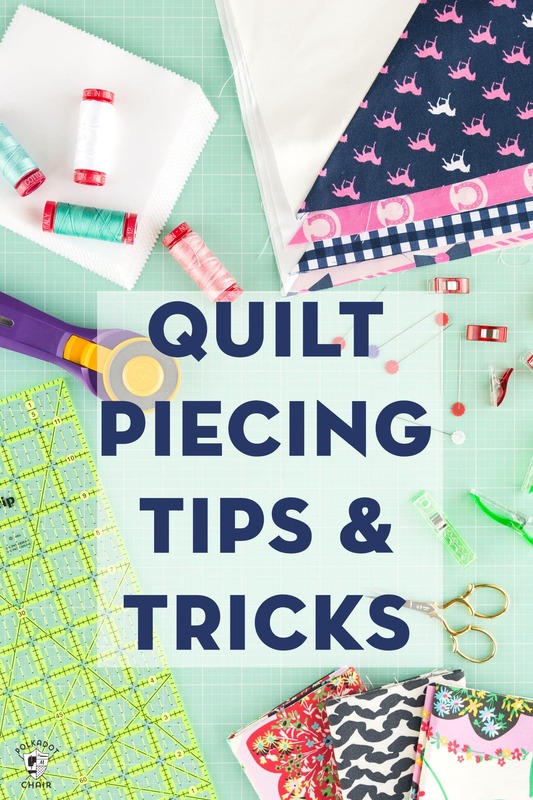 This tips will NOT apply to every quilt you make. But it does apply to the Halloween Haberdashery Quilt. On this quilt, you have diagonal seams. It was designed that way. 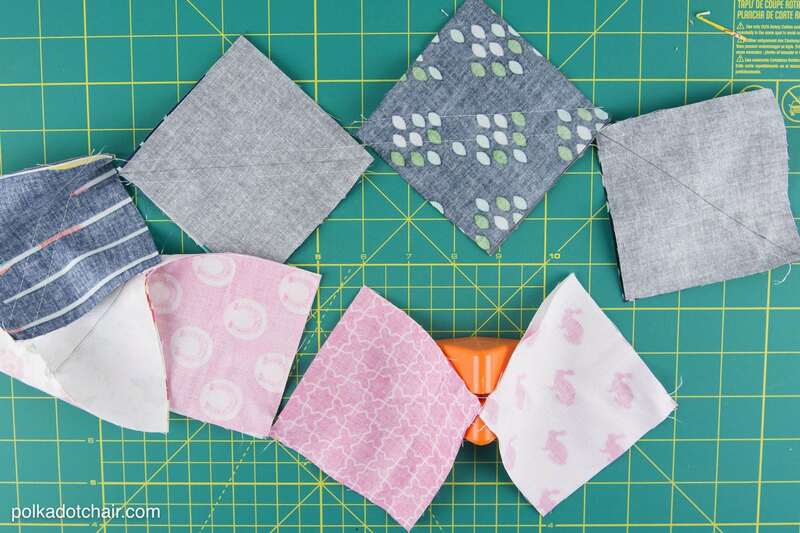 If your fabric is directional your fabric will be at an angle when your quilt block is done. It’s okay! Here is a photo of Erin’s quilt. You can see her backgrounds are all facing different directions. 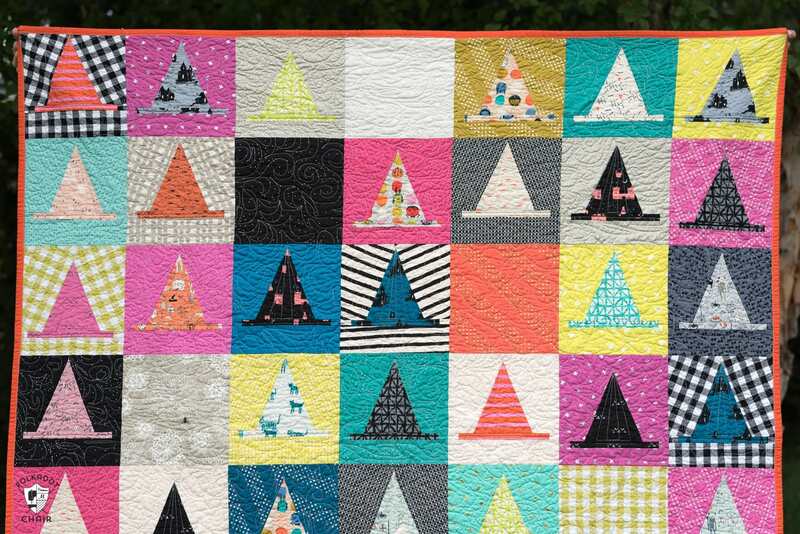 The only fabric that I would worry about being the right direction (for this particular quilt) is the witch hat. The rest of it will all blend in with your quilt. You can see on my quilt that I have my “words” in this block running in different directions. It doesn’t bother me. As I said, it is the way that this particular pattern was designed. I think it takes longer to make one block from start to finish, then repeat the process 40 times. Instead, I prefer to work in batches. I will sew the right side of the hat on all the blocks. Press and trim. Then sew the left side of the hat on all the blocks. Then move onto the next seam. There are parts of this quilt that you can chain piece. 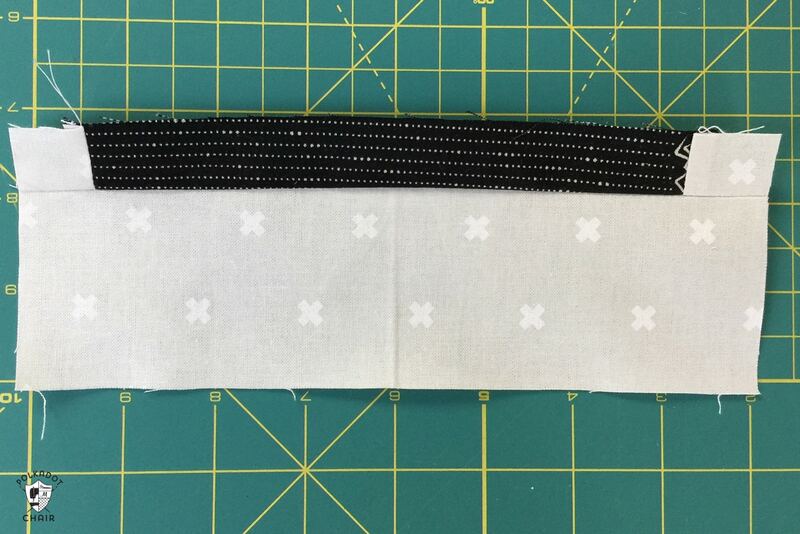 Which means essentially that you can start sewing a seam, then when you get to the end of the fabric, put the next piece under the presser foot and keep sewing. You’ll save time by not cutting your strings and restarting with each block. When you get to the end, simply snip the pieces apart. 9- Relax, it’s supposed to be fun. Guys, it’s a hobby. It’s just for fun. That doesn’t mean that there won’t be frustrating parts, but on the whole, it should be enjoyable. If you mess up, shake it off and move on. Take your time, and don’t be in a rush. Just think about Mr. Rogers singing ?”I like to take my time….” ? as you work. ?When I quilt I’m not out to win any contests (not that there is anything wrong with entering a quilt in a show or fair). I’m doing it for fun. Each quilt you make you will learn something new. You can then take that knowledge and use in the next quilt you make. If you’re new, gradually your skills will improve. The only way to learn and improve is to DO. Sometimes “doing” means messing up. If you mess up a lot and it’s terrible, what’s the big deal? Just don’t show it to anyone. Like I said. It’s supposed to be fun. Thanks Melissa #1 for working on giving us the “print friendly” page. I always look on every blog where there is something to download, as you well know ads take extra paper and a lot of color ink. I hate commenting but….on the Print Friendly page the is usually an option to print or PDF. I could not find that option here. I prefer to save as PDF and I can print when I am home. I read my blogs and email on my phone. I have no idea if the PDF button was optional or $$$. Has anyone else looked for the PDF? #2. Great work on the tutorials and Tips on the QAL. You are making this fun! I didn’t enable the PDF version. I had to take the print and PDF away a few years ago because people were selling the tutorials as PDF’s. It was pretty rampant, not just one or two. I’m trying the printing only this time to see how it goes. With a PDF someone will just email the post and not come over to visit the blog. It’s all a balance, people visiting the blog lets me keep the content free for visitors. If they don’t visit then I can’t keep running the site. 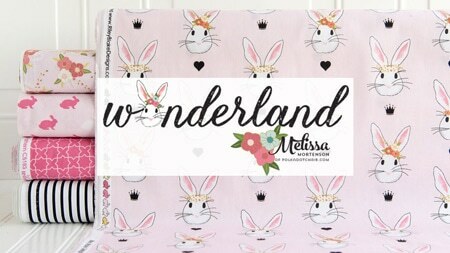 I have a secret Pinterest board that I pin projects I want to make in the short term too. You could pin the project to a board so you know where it is then come back and print when you are ready. 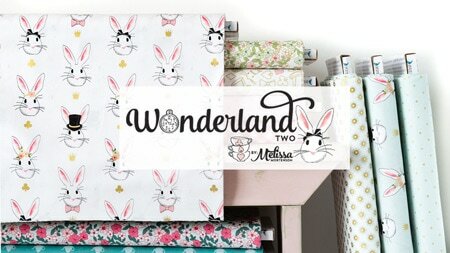 Random question, what breed is the dog in the shot with the bunny quilt? He’s adorable!